Is it safe to reboot MS SQL server in VMWare environment? VMware vCenter and VMware vCloud need a database to store important information (most importantly, configuration). Due to critical nature of data, database server needs to be an enterprise class one. Supported databases are Microsoft SQL, Oracle (for a full list, see here). Of course, high availability should be considered for database server, but you may wonder if it’s safe to restart database server for a short time? For example, say you still didn’t implement high availability and you need to do a Windows update. You want to reboot database server but you don’t intend to reboot the whole environment, I mean vCloud Director, vCenter itself, … So, the question would be: Is it possible that rebooting database server causes crash or any harm in other VMware components? I decided to experience this in my Lab environment and the answer is: It’s generally safe to reboot! And it seems reasonable; as long as you are not changing configuration on your infrastructure. Although, when I started some administration jobs in vCloud Director, like modifying a VM or adding a VM to a vApp, I got some weird error messages. In fact, vCloud Director complained: “Error while connecting to sphere profile driven storage service”. I never saw this before and actually I’m not sure what profile driven storage service is! So, I looked into my vCenter server. In Administration, Management, there was an icon, named ‘VM Storage Profiles’. It looked relevant, so I clicked on it. The error message appeared here too! Looking into the issue more, It turned out that there is a Windows Service named ‘VMware vSphere Profile-Driven Storage Service’ that was stopped, while it was ‘Automatic’ service. I started the service and everything got back to normal. 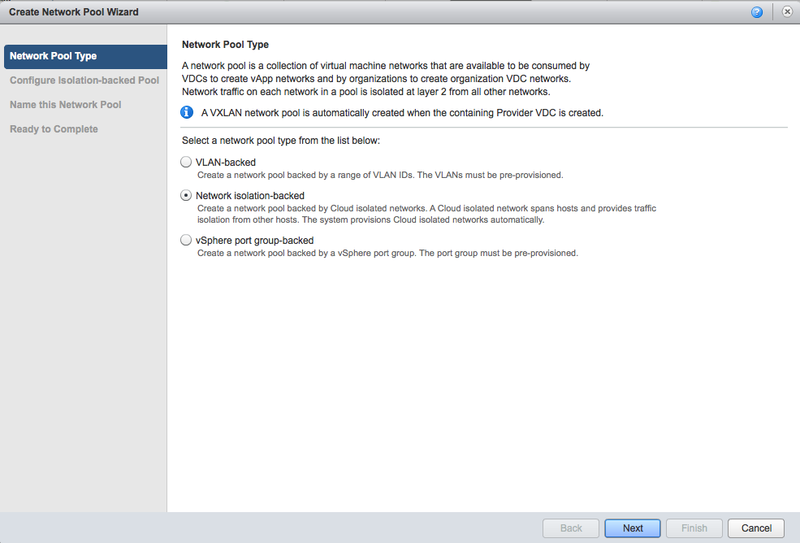 As everyone mentions, vCloud Network Isolation (VCNI) is the most complicated type of network pool in VMware vCloud Director. It is a proprietary technique (apparently by VMware) that uses MAC-in-MAC encapsulation to distinguish between different private networks in a single physical VLAN. Among all, VCNI has a big advantage for cloud administrators: It mitigates their need to deal with physical network administrators, because multiple VLANs can be created inside a single carrier VLAN; while in other types of network pools, a VLAN should exist or be created in physical network. Also, since it uses a proprietary technique to create virtual VLANs! (I know, it’s like Virtual Virtual LAN!) the number of VLANs is not limited (to 4096). Of course it’s not infinite, but it’s a very big number: 4 Millions. See here for more details. vCloud Director – It’s a secret to me why VMware doesn’t assign 1524 by default while it knows VCNI needs it! 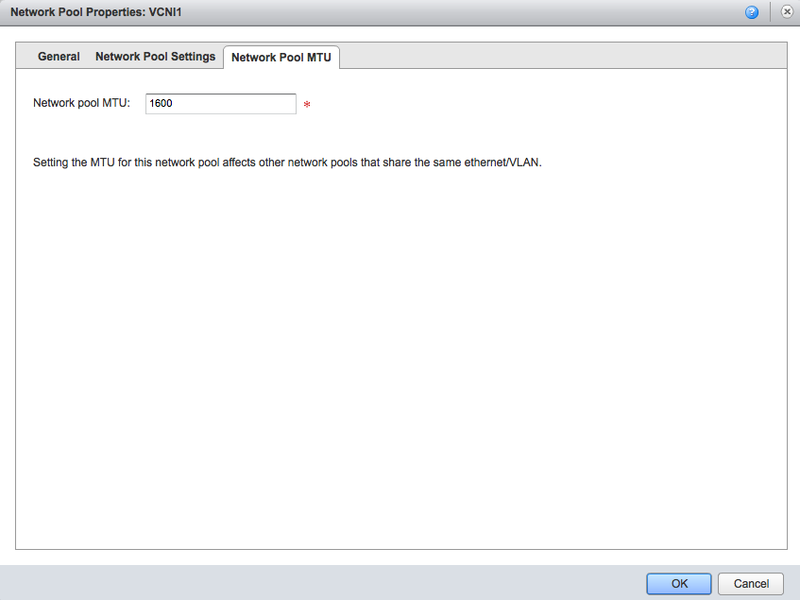 You can do this by right-clicking over this network pool and clicking ‘Properties’, then go to: ‘Network Pool MTU’ and change it to 1600.
vCenter: Go to Home, Networking, choose the distributed switch between hosts; right-click and Edit Settings, select Advanced; change the value of Maximum MTU to 1600. Physical switch – Depends on your equipment, but should be done. p.s – If MTU is not changed, VCNI will still work but with poor performance because of fragmentation. Well, there should be a beginning for everything and yes, it’s the beginning for this blog! So, let’s go over this cliche quick. It’s going to be a technical blog about networking, as its name implies: some tweets about networking! I’m prone to cloud topics, though it won’t be limited to cloud stuff. You may ask do we need just another blog about networking or cloud computing? Ummm, I would say the number of ways to approach a problem equals the number of people who think about it. Networking and cloud is not a different story and this variety in techniques is beautiful! My name is Mehdi Kianpour, now living in Canada. It’s like 15 years I’m working in this field and I think I can add something to online resources that may help other people fix their issues or understand a concept quicker. Recently, I’m engaged in some projects that are dependant on cloud technologies. Of course, we all know that cloud is the new (almost new) trend, while comparing to other networking stuff, there is less independent information over Internet. I will try to talk about some less experienced tasks and address some yet unknown issues and I hope this blog to be useful in this field. And last but not least, I’m looking forward to hear from everybody (in specific other specialists) in my blog about the topics I cover or any other comment. So, see you soon!